Sainz Jr (1) edges Martsenko to lead into turn one. © WSR (Florent Gooden / DPPI). 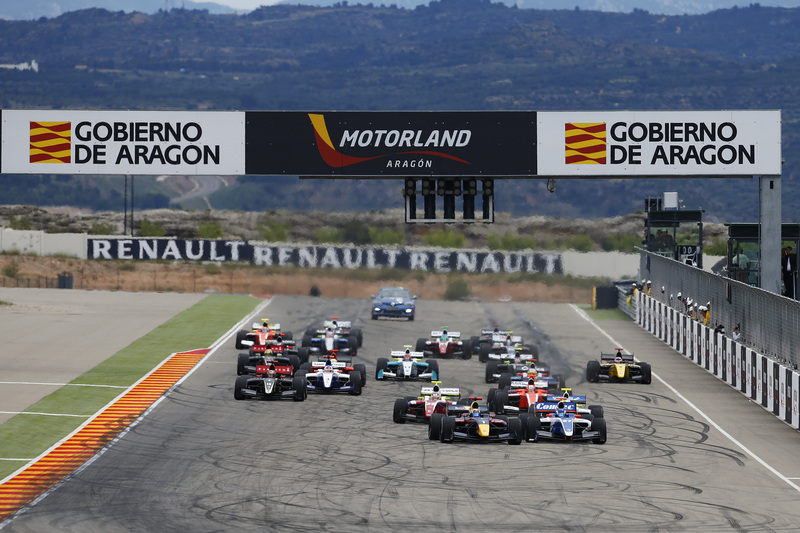 DAMS’ and Red Bull junior driver Carlos Sainz Jr dominated the opening race of the second Formula Renault 3.5 round at Motorland Aragon. The Spaniard led from pole, after fending off an aggressive Nikolay Martsenko (Comtec) from the line, but was unchallenged thereafter. In clear air, Sainz Jr extended a gap almost every lap around, eventually securing a lead of 14.3s come the end of 25 laps. 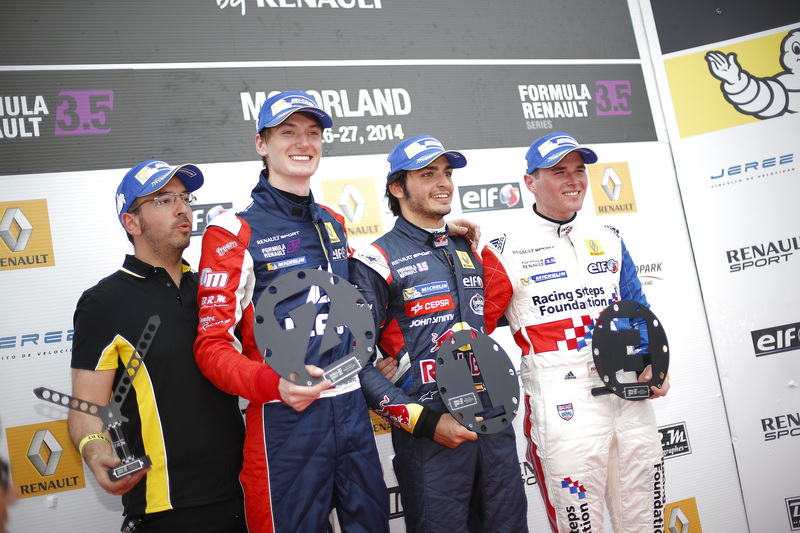 Such was Sainz Jr’s dominance; the 19-year-old had pulled a gap of more than 30 seconds beyond those outside the top four. Martsenko not only held on to 2nd place, but even pulled more than ten seconds over his chasing rivals to score his first podium in the category – something the Russian put down to his decision to run a higher downforce setting than those around him. A tricky start and missed apex in turn one by Fortec’s Rowland saw him drop from the front row to 4th; however the Racing Steps Foundation driver took 3rd back when he passed Zoel Amberg (AVF) on lap 13; however by then Martsenko was lost in the distance. As Rowland moved up to the podium place, Lotus’ Marlon Stockinger took advantage to claim 4th, relegating Amberg to 5th, but despite his best efforts, the Filipino was unable to take Rowland in the final laps. Over the line, Rowland held Stockinger at bay by a mere two-tenths. Amberg, meanwhile, continued to fall backwards toward Robert Merhi (Zeta Corse) and Matthieu Vaxivière (Lotus), but neither could push beyond Amberg. While 7th was not necessarily an ideal result for Vaxivière, the Frenchman was pleased having started 13th on the grid. Sergey Sirotkin (Fortec) took 8th place ahead of the Arden of Pierre Gasly – the latter of whom drove the race with a damaged nosecone – and Pietro Fantin closed out the top ten for Draco Racing.